Welcome to Tales from a Cancer Mama! In December of 2011 my little 22 month old son Griffin was diagnosed with Rhabdomyosarcoma, a rare and aggressive type of muscle cancer that grew in his right eye orbit. We spent three weeks in the hospital trying to get a diagnosis and then a biopsy before returning home on Dec 20th with our answer. CANCER. I got a freaking DISEASE in my BABY for Christmas. I was a mess inside but an emotionless zombie on the outside. Mentally, I knew I had a job to do but no idea how I was actually going to do it! After living in the hospital for three weeks, totally unprepared, I was dreading coming home to an empty house. We never had time to put up any decorations, a tree or even a few lights outside. I was dreading coming around the corner to see my sad house, the only one not lit up on the block. It kind of represented how I was feeling. Sad, dark and alone. My husband drove our car around the corner and grabbed my hand. There were lights on our maple trees! There were ribbons on our bushes, lights along our house. Our little house was BEAMING with holiday cheer! HOW DID THIS HAPPEN!?! I ran out of the car in my hospital slippers into the snow to watch the wonder of our house. I stood in the snow, looking up at my trees. This was not a professional job at all. It looked like Christmas barfed on my lawn. The lights were mismatched and crooked. Any other year, this would have bothered the OCD inside me, this year? My heart SANG!!! I’ve never been on the receiving end of a Christmas miracle, it was absolutely amazing!!! It turns out, my co-workers contacted my Mum to see how they could help my family. And then they took up a collection of old Xmas lights (That explains the mismatching lights) and then some volunteers came over the night before to attack my house. But when they got there, they realized that they didn’t have a ladder and all the SHORT people volunteered to help! HAHAHA so only the very lowest branches of my maple trees at lights, the short bushes had ribbons and they had lined the MIDDLE of my house with lights not the roof top. Apparently someone had tripped on and landed on the drainspout of my house, falling and crushing it. Hearing this story made me cry so hard, happy tears. These were my awesome co-worker family, nutty and amazing. I noticed that I craved a sense of normal in my life. I did not want to be a Cancer Mama. I was forced into it. Once you are diagnosed with Cancer, your little world is tipped upside down, people don’t treat you the same and you don’t even recognize yourself in the mirror. The familiar feeling of Christmas lights in my trees and wrapping my house in cheer was the EXACT pick-me-up my little family needed. 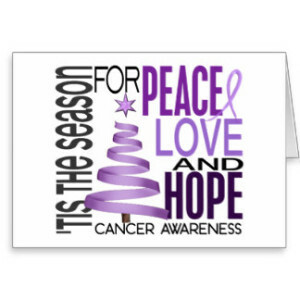 If someone you know has been diagnosed during the holiday season, please reach out and see what they need. SUGGEST what you can do. Lots of people would “say” just tell me what you need, well sometimes, I don’t know what I need! Or I don’t want to impose, but if you offered to make Christmas dinner, or maybe a trees put up, cards mailed or cookies baked? Maybe their driveway shoveled? Or even just a nice chat with a cup of cocoa to warm the soul. Most would take you up on your offer!!! Happy Holidays and remember, you are never alone. All cancer survivors! 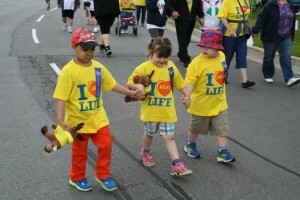 Walking together, surviving together! Have you ever felt guilty about something? Maybe you stepped on a bug on the sidewalk? Elbowed your kid in the head by mistake? Ran over a squirrel in your car? I think we have all done these things, felt guilty about it for a moment and moved on. I once was shopping in Zellars (The Canadian version of Kmart) with my Mom, and I was young enough not to be able to see over the counter, so I was five maybe? I was REALLY excited over this new Barbie my Mum let me pick out. I clutched her in my arms throughout the entire store, I looked into her eyes and day dreamed of the dressing changes we would be doing and plastic car rides we would be going on. My Mum bustled me along, as she grabbed her bags to leave. Out in the parking lot she realized I was still clutching the dang Barbie and had not paid for it. I remember her DRAGGING me back into the store like some common criminal. I was embarrassed, but more than anything, I felt GUILTY. Like a deep ache of guilt, like would be Mum ever forgive me? Could I ever forgive myself? Will I still get into College? Fast forward 20 years and here I sit, snuggling with my beautiful healthy five year old boy that happens to be a cancer survivor. Yes, we have a few side effects and setbacks due to Cancer, but in the grand scheme of things, we had a very lucky journey. As I sit here, running my hands through his hair that grew back a much darker colour, I cannot help but to think of the friends of ours that are still battling the disease. Why is my child ok but theirs has relapsed? Why did they go through 12 ports and ours was perfectly fine? Why is my child alive while theirs is dead? The guilt swallows me up some days. Do I deserve to have a healthy child when some great Mums out there are missing theirs? I can’t wrap my head around it. Logically, I know it’s silly, I should be shouting from the roof tops and dancing a jig at our luck. But how can I be celebrating when other kids are dying? When other kids are still fighting? Apparently it’s called Survivors guilt which is a part of my PTSD. That’s great that there is a nice little name for it…but how do I fix it? The long and the short of it? I DID make it in to college, LOL the Barbie trauma is long behind me. But the Survivors Guilt? I find myself inserting myself into my Cancer Community, doing things like running a Parent’s Support group, organizing a Super Hero sewing bee so every sick kid gets a Courage Cape and lots of fundraising events through the year. Events like Relay for Life is a great day where Cancer Families and their supporters plus great members of the community get together to walk together and raise money. Its a way of connecting. Look up your local Cancer Society or Ronald McDonald House as they always never volunteers I feel like instead of filling my heart with guilt and dread, I actively fill my heart with love from these other Cancer families. Yes, by putting myself out there, I could get hurt again as our friends may relapse but the love far outweighs any of the bad. The guilt? I will never be able to fix it but I CAN put it in a figurative little box, with a pretty little bow. I know it’s always there, tugging at my heartstrings but I don’t have to open it all the time. I keep it close to my heart, I think about those kids all the time but I’ve learned that it doesn’t have to take over my whole day, I don’t let the guilt consume me anymore. I’m allowed to laugh and enjoy my cancer-free child. We all know life is just too precious and too short to be worried about something I cannot change. Hug your babies tight tonight…and remember, you are not alone. Want More of Cancer Mama? Life living with, through and after Cancer from a Parent’s point of view.